and making it available to everyone. With this gadget, your readers will be able to search not just your posts, but web pages linked from your blog, your blog list, and link lists. To add the gadget, go to your blog's Layout page, then click “Add a Gadget” and click on “Search Box.” Configuration is easy: just select which elements you want your readers to be able to search. Since its launch on Blogger in Draft we’ve made several enhancements to the look and feel of the gadget. It now provides simpler defaults, picks up your blog’s style and colors, integrates more tightly with your blog, and allows you to configure search across specific blog lists (in addition to link lists) The gadget uses the AJAX Search APIs to provide a tightly-coupled inline experience, and creates a Custom Search Engine for your blog that automatically updates when you update your blog, blog lists, or link lists. Please let us know what other features you'd like to see in this search gadget. 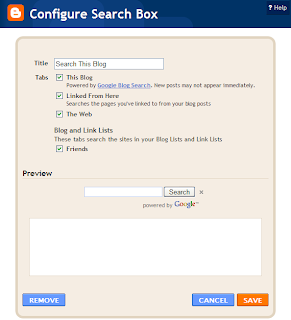 Today we’re bringing the Search Box gadget out of Blogger in Draft and making it available to everyone. With this gadget, your readers will be able to search not just your posts, but web pages linked from your blog, your blog list, and link lists.